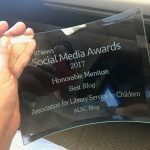 Rochester (MN) Public Library’s core values focus on being a welcoming and inclusive environment. A few years ago we started to hear from adults and teens in the community that there were not a lot of safe spaces for LGBTQIA teens to hang out, so in our 2015 Action Plans we included “Develop programming to specifically meet the needs of Rainbow Families and LGBTQIA teens” and got started. Before we share our ideas for serving LGBTQIA kids and families, let’s talk about “LGBTQIA”. LGBTQIA stands for Lesbian, Gay, Bisexual, Transgender, Queer or Questioning, Intersex, and Asexual or Ally. Without including the word “queer”, this alphabet soup is not inclusive of the entire spectrum of sexual and gender identities out there. But as you can imagine, when we use the word queer in our program descriptions or trainings, people have a lot of questions. Queer is a word with a terrible history, a confusing present, and a bright future. It was used negatively for many years, but over the last 30 years or so has had a comeback as a word that is embraced by many people as an identity, and is used regularly as a positive umbrella term for the LGBTQIA community (think: “Queer Eye for the Straight Guy”). Like any word, it can still be used negatively. It is all in how it is used and delivered. We would not label someone as queer who had not self-identified, nor would we refer to someone as “a queer” – those would be negative and inappropriate uses of the word. Our use is to be inclusive of the many teens and grown-ups in our community who self-identify as queer or under the queer umbrella. Embracing their choice of word further proves our commitment to creating a safe space for them. If you would like to read more try this website, this article, or this. Why are we focusing on serving LGBTQIA kids & families? 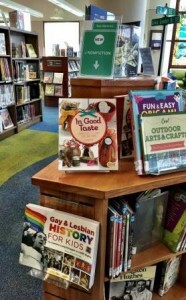 Youth Services at RPL started undergoing changes in 2011 that included things as small as purchasing and displaying more books with LGBTQIA content. Once these books were on display and available in the library catalog, we started to hear from customers who appreciated having access to them. We also started regularly printing and keeping on display a Booklist for Rainbow Families which received a lot of positive attention. The conversations that we had around the books and booklists brought to light a need in the community: LGBTQIA kids and families needed safe spaces, they needed to see themselves represented in the library collection, and they needed to feel welcomed! We also have bigger reasons for wanting to provide a safe space for LGBTQIA youth and families. The Human Rights Campaign study “Growing up LGBT in America” reports that 4 in 10 LGBTQIA youth say the community in which they live is not accepting of LGBT people, and and only 21% say there is a place where LGBTQIA youth can go in their community and get help or be accepted. LGBTQIA youth face higher rates of bullying, homelessness, substance abuse and suicide, but teens who have supportive families and friends or safe spaces in their community are better equipped to deal with these additional challenges. So what can libraries do to serve LGBTQIA kids & families? There are easy things you or your staff can start today to be good allies. Being inclusive with your language doesn’t hurt anything, and can go a long way to making everyone feel more comfortable. For example, when talking to kids about their parents, use “grown-ups” or “adults” or another neutral term that feels natural to you. Not every kid has a “mom” and/or a “dad”. You can also choose to use gender neutral terms to refer to individual kids or groups of kids. Use “people” or “friend(s)” instead of “guys” or “ladies”. 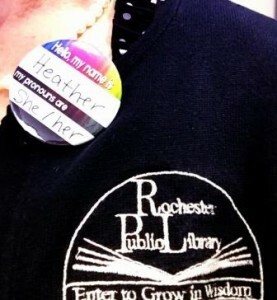 Another easy change is to wear a pronoun name badge. Even if you have never been mis-gendered, wearing a name badge with your pronouns on it sends a message to everyone who sees you that you accepting and welcome conversations about pronouns. It also opens up opportunities to talk about how and why your library is a safe space or the LGBTQIA programs you offer. All staff should pay attention to what is happening in your space (bullying). Some bullying can be subtle; watch the way teens are interacting in your teen space. When a certain group arrives, does another group always leave? Talk to your teens and make sure you know what is going on. Some bullying that starts at school may continue at the library after school. Your library may also have business practices and procedures that need to be updated in order to be inclusive to your LGBTQIA community. Does your library card application ask for a person’s gender? Does it need to? Do you allow a patron to use a preferred name on their library card in addition to or instead of their legal name? What about your bathrooms – do you have single stall restrooms that you could convert to gender neutral spaces? The next step is to start the safe space conversation with the rest of the community. 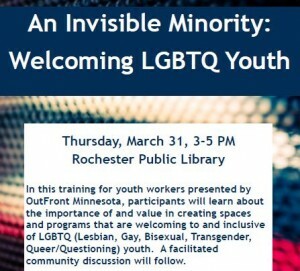 Meet with other youth workers in your community to talk about LGBTQIA services and creating safe spaces. The library can be a great neutral ground for offering training that is open to community youth workers. It’s important for LGBTQIA youth to see themselves reflected in the books they read. According to GLSEN’s 2013 National School Climate Survey, only 19% of LGBTQIA students report that positive representations of LGBTQIA people are included in their school curriculum. There are a lot of really great books (fiction and nonfiction) available with LGBTQIA content, with more and more books coming out (get it?) every year. Not all of them are published by big houses, and not all get picked up for reviews, but it’s worth the time to seek out the titles to make sure your collection is representative of the full spectrum of gender/sexual identities. To get started, check out the ALA GLBT Round Table’s Rainbow Booklist. 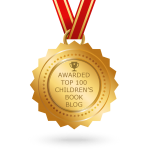 The Rainbow Booklist Committee reads hundreds of books with LGBTQIA content and publishes its best-of list for kids and teens annually. 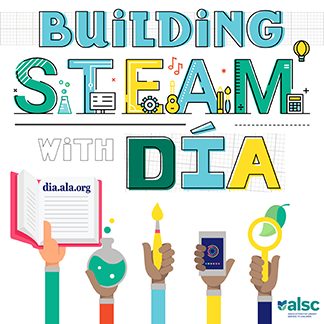 In addition, ALA’s Stonewall Award and the LAMBDA Literary Awards both have categories honoring Children’s an d Young Adult Literature. Once you’ve got the books in your collection, you want your patrons to know they are there! While special displays highlighting LGBTQIA materials are great, it’s important to include LGBTQIA materials in all of your displays and booklists. Once you have created a safe space and opened dialogues with LGBTQIA customers and community members, you will start to hear about programs and resources that people would like to see in your community. Our first program focusing on LGBTQIA teens was q club. q club began in September 2014 with just one teen; it now boasts regular attendance of over twenty at each meeting, and is hands down our highest attended teen program. Like all of our teen programs, we let the teens decide what activities we plan and what topics we discuss. 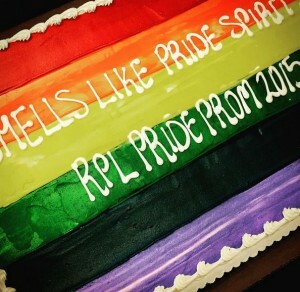 Last summer, in partnership with Gay/Lesbian Community Services of Southeast Minnesota (http://www.glcsmn.org/), we hosted the first ever Pride Prom “Smells Like Pride Spirit” in Rochester. Forty-four teens attended and afterwards some called it the best night of their lives! 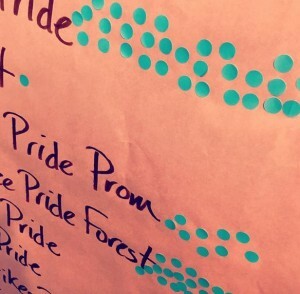 We are currently in the early planning stages of our 2nd Annual Pride Prom. q club teens are interested having the chance to just hang out and be themselves, and they are also embrace opportunities to have their voices heard in the larger community. 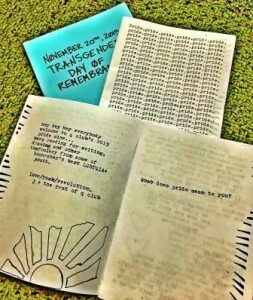 They have created zines to celebrate Pride, National Coming Out Day, and Transgender Day of Remembrance which they distributed at the library and at local businesses. q club teens were a large voice in our October National Coming Out Day celebration, and will soon be participating in a community health needs assessment. 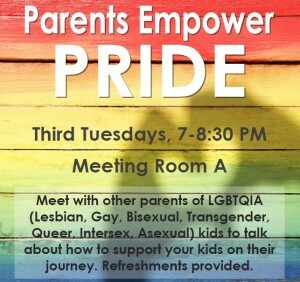 Parents Empower Pride: a meet up for parents of LGBTQIA kids to talk about how to support their kids on their journey. Pride Prom: An annual a safe & welcoming after-hours party for LGBTQIA teens and allies in grades 7-12 held during Rochester’s Pride Fest. Rainbow Family Storytime: During Rochester Pride we offer Rainbow Family Storytimes for preschool children and families. Just in the last month we have received two more requests: one to offer a q club for tweens and the other to offer a meet-up group for kids of LGBTQIA parents. As staffing and space allows, we will make these programs happen. Even without special programming just for LGBTQIA youth, you can ge started by integrating inclusive LGBTQIA materials into your regular programs, such as storytime or book clubs. The possibilities for inclusion are endless. We would love to hear what you are doing to serve LGBTQIA kids and families at your library! Heather Acerro is Head of Youth Services at Rochester (MN) Public Library. 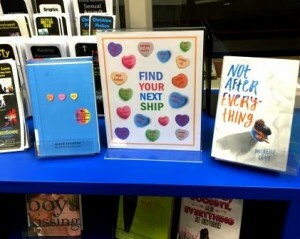 Sarah Joynt is Teen Librarian at Rochester (MN) Public Library. Heather and Sarah use the pronouns she/her/hers, but they are okay with they/them too, even when you are just talking about one of them.